This is small sample of our collection of Chinese Propaganda Items. From the Cultural Revolution Period and are guaranteed to be authentic. The collection includes many posters,books,ceramics,brocades and original paintings. "Grasp Revolution, Enhance Production, Promote Work and Prepare for War"
This is a rare commemorative poster from the start of the Chinese space program. China has launched their first manned space craft this year. 3-in-1 big size poster; Title” The Successful Launch of the First Satellite of China is a Great Victory of Mao's Thoughts! "; size at 66x86cm each or 192x86 cm (75.5x34 inches)in total; poster in separate condition, some folds particular on the left panel near the bottom title area and a small tear near the left edge of the white circle; overall in very good condition and all panels look as fresh as newly issued; Published by Yuen Nan Peoples' Publishing House in 1970 July; with clear imprints on right bottom corner; Very rare posters. Yuen Nan People's publishing House didn't publish many posters during the CR period and this is the only 3-panel posters published by them. 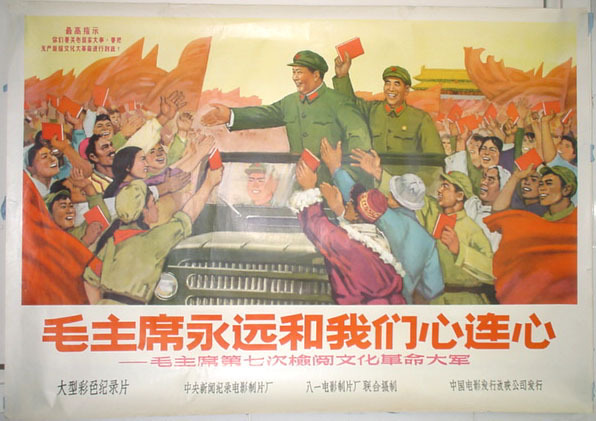 "Chairman Mao is With Us Forever!” This is among the best and rarest Maoist movie poster from the late 60's. This is the authentic 1967 poster not an eBay fake. "Follow Closely Chairman Mao and Leap Forward!" "In Response to the Calls of Chairman Mao to establish a Strong National Army and Economic Power! 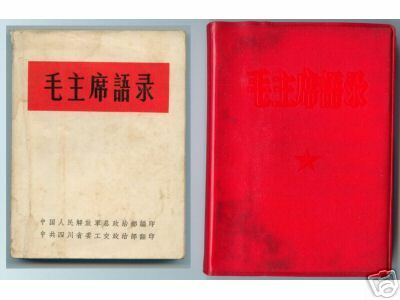 "; by famous artist; published in June 1951 by People's Liberation Army Pictorial;First edition at only 70,000 copies; excellent condition; 30 x 21 inches; This is a model for all later versions of Maoist poster with Mao head and all three divisions of Army, Navy and Air Force. Scarce item from 1951!!! This was the occasion of the 15th anniversary of the PRC, and a celebration to defeat the American enemy and his atomic bomb. Which takes place in front of the hall of the people in Tiennamen Square. The year 1964 is marked by the beginning of the war in Vietnam and a series of international events which awoke the sentments of the imperalistic Chinese. This was also the time that china began an interest in atomic energy and its uses. 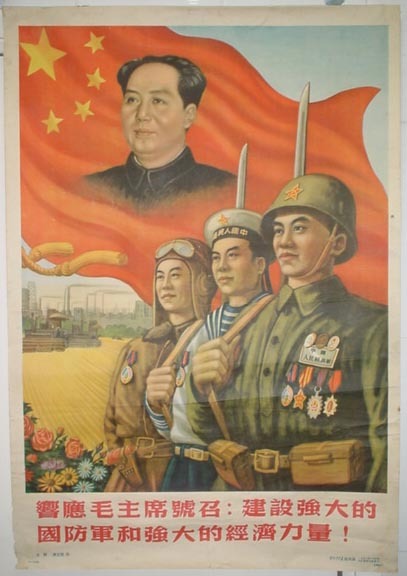 "Hold High the Red Red Flag of Chairman Mao"
A Huge size poster 30 x40 inches with main graphic in very good condition there are two white pieces missing on the left and right top margin. Published April 1966 by thr Shanghai PPH, right before the start of the Cultural Revolution. 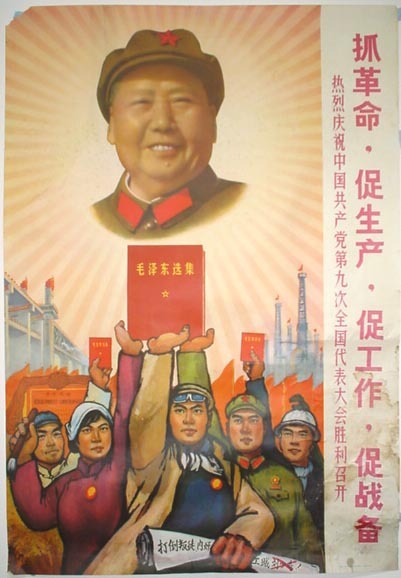 Strong action poster with a wonderful portrait of Chairman Mao. "CHINESE PEOPLES LIBERATION ARMY IS ONE PEOPLES ARMY WHICH CHAIRMAN MAO FOUNDED, LEADS AND COMMANDS BY HIMSELF". Rare Two-Sheet poster designed and painted by Wu Min, produced by Tianjin Peoples Printing Factory, published by Peoples Art Publishing House, and sold by Xin Hua Bookstore, Beijing Department, May 1977. 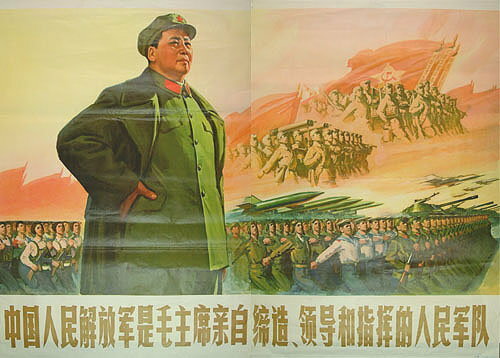 First edition, 1st printing of this massive five-foot poster, published after the death of Chairman Mao but intended to honor his memory and indicate that even now he inspires and leads the people of China. 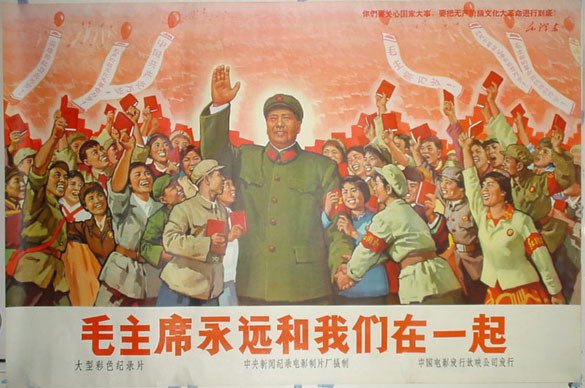 Written on the banners of the three flags towards the left top margin translates "Chinese Peasant and Workers Red Army". Two-Sheet and Three-Sheet posters were produced in China chiefly during the 1970s but are now seldom found still in their original unassembled separate sheets, complete and in relatively decent physical condition. One in Red Vinyl And One in White Wrappers. These are complete examples with no missing pages. I have most of the sought after early PRC Publications. 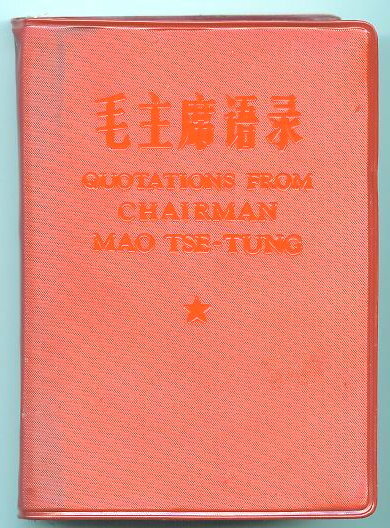 MAO (Tse-Tung): QUOTATIONS FROM CHAIRMAN MAO [in Chinese and English]. Peking: The East Is Red Publishing Company, August 1967. Portrait of the Author (in brown ink), also complete with Lin Biao's facsimile calligraphic endorsement "Study Chairman Mao's writings, follow his teachings and act according to his instructions". 16mo, [viii], xv[i] 589pp + colophon leaf; original white stiff board covers with sewed headbands at both ends of spine, slipped inside its original flexible red vinyl covers (blind-stamped with title in both languages on the front cover, a Red Star blind-stamped and centered below). Notes: First Edition, 1st printing of the LRB as a bilingual text: Chinese and English on alternating pages, published on the first anniversary of the start of the Cultural Revolution.